Many thanks to Xavier Marjou for extracting the detailed splits for the Kona race. Patrick’s day didn’t start well: Usually he is a front-pack swimmer, but this year he lost contact with the lead group and was more than three minutes behind the lead in T1. 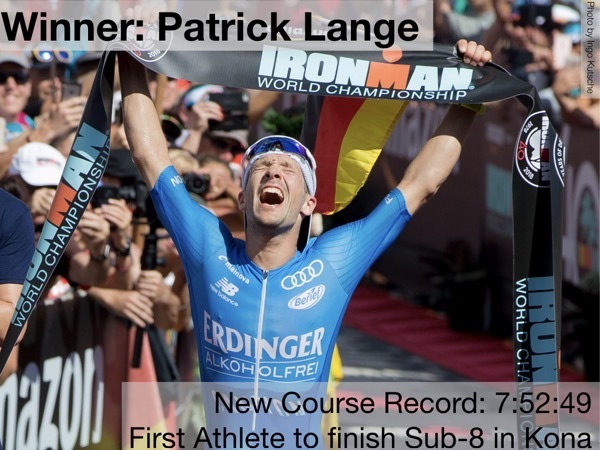 Aside from Sebastian Kienle’s win in 2014, the winners have always started the bike in the Top 10 group – this year Patrick started the bike in 19th place and well back from the Top 10. But when his team-mate Andi Dreitz was able to ride up to the front of his bike group, Patrick had a strong ally who was keeping the pace high but even. This worked extremely well for Patrick: They quickly rode up to athletes such as Tim O’Donnell, Braden Currie or Javier Gomez, faster swimmers that weren’t keeping up with the fast pace at the front. As the race progressed they weren’t losing much time to the leaders, and more and more athletes were not able to follow Andi’s pace. Both Patrick and Andi said after the race that this wasn’t pre-planned, but comments by Braden Currie indicate that Andi was setting exactly the right pace for Patrick and that they were working extremely well together. Patrick’s improved Kona bike times show his progress on the bike: He rode 4:37 in 2016 (when he was third), then 4:29 last year and 4:16 this year. The fast conditions certainly played a role as well, but even his normalized bike times improved from 4:38 via 4:33 to 4:29 this year. By the time the group reached T2, Patrick was in a great position: Last year he was more than ten minutes back from the leader, this year less than seven, and – probably even more important – he had no one in front of him that could be expected to run well. 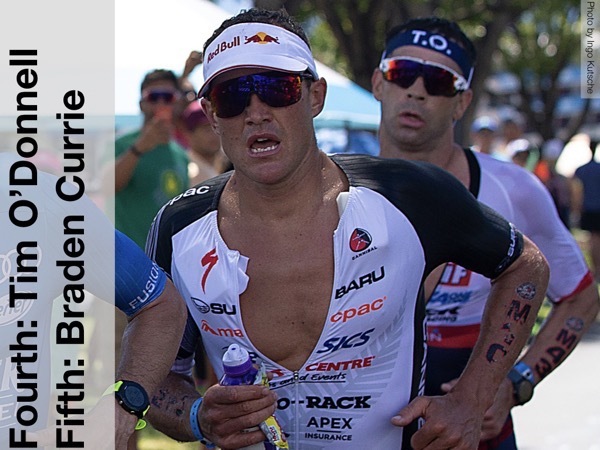 After T2, he was running his own pace even when Tim O’Donnell or Braden Currie were a few seconds in front of him. After climbing Palani he was slowly but steadily running away from them, taking the lead at about ten miles from Cam Wurf. He continued to extend his gap over the other runners and ended up posting the fastest marathon of the day. 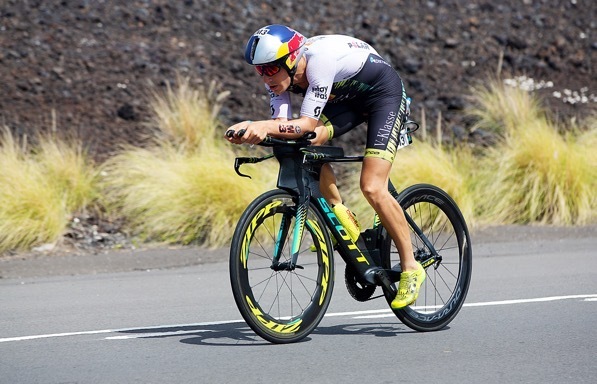 A 2:41 was slower than his 2:39s in the last two years, but after a fast bike his final time was 7:52, the first sub-8 time in Kona and a clear win by four minutes. 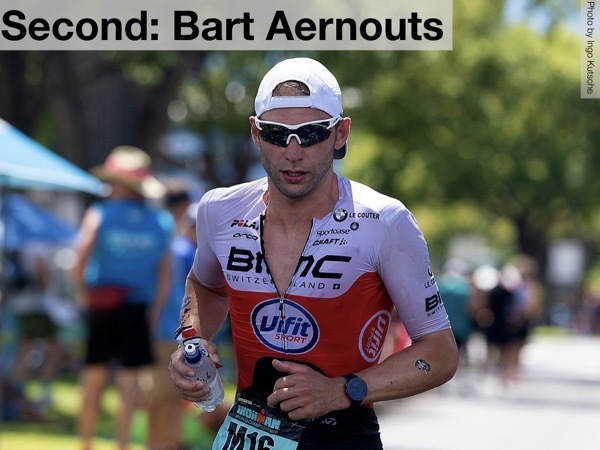 Bart had finished in the Top 10 a few times before (last year he was 12th), usually he loses some time in the swim and on the bike, but then a good marathon allows him to move up into the money slots. In the last two years he has stepped up his game, allowing him to win Lanzarote, Roth and Hamburg – still aided by a fast run, but he was starting the run in a better position than before after he was able to step it up on the bike, and this year’s Kona race is another indication of his faster bike. Together with a couple of other strong bike riders, he was able to do something very unusual in Kona: Usually if you’re behind the group in Hawi, you’re only losing more time on the way back to Kona, but Bart made up time to the main bike group after the turn. At 60 miles he was still three minutes behind the Dreitz/Lange group and riding in 34th place, but then together with Michael Weiss, Matt Russell and Joe Skipper he was able to ride up and reach the main group about ten miles from T2. Bart started the run in sixth place but was running a similar pace to Patrick Lange. When Patrick stepped up the pace, he wasn’t quite able to stay with Patrick, but he moved into second place not too far behind. When Patrick continued to run well, Bart lost a total of four minutes but he was able to distance all the other athletes that started the run with him and to hold on to his second-place finish. He also finished under eight hours. 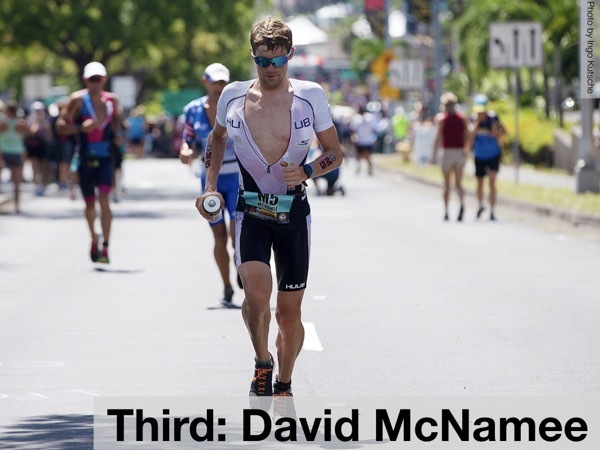 At a cursory glance, David’s 2018 race was pretty similar to last year: After a good swim he lost just over ten minutes to the leaders on the bike, but then a good marathon (last year a second-best 2:45 marathon, this year a third-best 2:46) allowed him to pass most of the athletes that were in front of him in T2. Looking closer, for most of the race another podium result was even more unlikely this year. As usual David was just two minutes behind after the swim, but then the pace at the front (mainly set by Andrew Starykowicz and Cam Wurf) quickly saw him drop back further. And while last year he was able to ride with Patrick Lange into T2, this year Patrick and his group quickly passed him after less than 20 miles on the bike. After the turn in Hawi, David was riding for a while with the strong bike riders such as Bart or Matt Russell, but then lost contact to them when they increased their effort in order to close the gap to Patrick. David rode the last part of the bike with Sebi Kienle and Lionel Sanders who didn’t have a good day, losing three more minutes to the front in the last 20 miles of the bike. All this meant that David started the run in 19th place (compared to tenth last year), five minutes behind Patrick Lange and many other good runners that had been able to ride up to Patrick. At the start of the run the focus of the coverage was on the group around Patrick, but David matched their pace on Ali’i Drive and quickly started his climb in the ranks far away from any cameras. By Palani (about 8 miles into the run), he had overtaken Joe Skipper and Matt Russel (see photo below), and he was already in the Top 10. He passed the duo of Tim O’Donnell and Braden Currie in the Energy Lab and had moved up into third place. Patrick and Bart were too far ahead of him and running too well for any further improvements, but he could enjoy the last section before crossing the line, claiming the third podium spot for the second year in a row. Both Time (who was in the lead group) and Braden swam faster than Patrick, but when the Dreitz/Lange train got rolling, they were swallowed up after 20 miles (Braden) and 40 miles (TO). Apparently they were content to stay in that group – Andi Dreitz reported after the race that no one was willing to take the lead in the group from him even when he was sitting up. Consequently, both Braden and Tim reached T2 with Patrick. Tim had the quickest transition and started the run a few seconds in front of Braden and Patrick, but the three of them were quickly running together, closely followed by Bart Aernouts. When Patrick slowly ran away after the climb on Palani, Tim struggled a bit, but Braden never managed to build a lead of more than 15 seconds to Tim and by mile 15 they were back running shoulder to shoulder. It wasn’t until the final hill before town that Tim was able to build a gap to Braden, and he turned himself inside out to claim fourth place. Braden was totally spent as well and crossed the line just a few seconds in front of sixth place Matt Russell. Both Tim and Braden are probably satisfied with this year’s results, but I’m sure that they will be looking to step it up next year. This year showed that Patrick continues to be the strongest runner in Kona, so they will have to build a gap on the bike. This year they might have been able to capitalize on their lead after the swim, but usually Patrick is a better swimmer and it’s unlikely that such a situation will happen again next year. This leaves the second half of the bike. With the good conditions and the speed of the bike leg this year, maybe they thought that Patrick was biking too hard and wouldn’t be able to run well. Who will be able to put time into Patrick on the bike next year? Both lost some time in the swim, but as they are typically slower swimmers they can be quite happy with staying with the main group (Joe) or losing just three minutes to them (Matt). They were part of a strong bike group that formed in the climb to Hawi and on the way back into town was able to close the gap to the main contenders around Patrick. After the race Joe mentioned that his focus in the early part of the run was to make sure he was running his own pace, giving him a chance not to overheat. Even then, he and Matt were running close to each other, slowly gaining one position after another. On the Queen K they moved into the Top 10, and even the heat in the Energy Lab didn’t slow them down. Matt was able to build a small gap to Joe, finished in sixth place and was almost able to run down Braden Currie. Joe took some more time to enjoy the last mile and finished seventh, a minute behind Matt but well ahead of the next athletes. Andy Potts (dark red line) was racing his own race for most of the day: He didn’t follow the strong swimmers and started the bike in the second group about two minutes behind. When the big bike group overtook him, he didn’t follow them and for a while settled in the group behind them. When that group split up (part of the chasing the Dreitz/Lange group), he once again didn’t chase and continued to ride his own pace. At the end of the bike he was 18th, taking his time in T2 and again continuing to run at his own pace. It wasn’t until the end of the Energy Lab that he moved into the Top 10, passing some more athletes in the final miles and finishing in eighth place. The athlete probably getting the most camera time was Cameron Wurf (green line). After a great swim in the main group (three minutes behind Josh after almost seven last year), he quickly worked his way to the front, breaking away from the rest of the field with Josh Amberger and Andrew Starykowicz. Starky was doing most of the work leading up to Hawi, but when he and Josh started to struggle at around 75 miles, Cam was powering away, building a lead into T2 of over two minutes to Starky and about six minutes to Josh who was almost swallowed up by the Dreitz/Lange group. By his own account he did not push the pace but was focused on an even output and putting himself in a position for a good run. After posting a new bike course record of 4:09:06 (another three minutes quicker than last year), he was leading the run similar to last year. 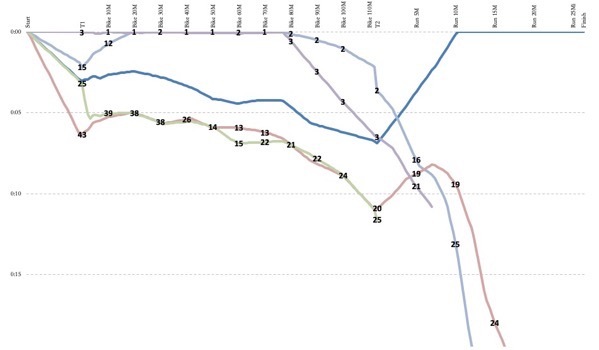 But while his lead in 2017 was very short-lived (Lionel Sanders overtook him after less than two miles), this year he was running much better and was able to hold on to his lead for much longer. But by the time he hit Palani at about eight miles, his lead had already shrunk to less than two minutes. When Patrick Lange stormed by him on the Queen K, the two exchanged a quick first bump. Cam was quickly overtaken by more runners and he fell out of the Top 5 in the Energy Lab. He started to run with Javier Gomez who wasn’t able to run at the level he was hoping for before the race. Both were losing a few more spots, and in the end Cam was even able to run away from Javier, claiming ninth place with a marathon time of 3:06, a huge improvement over his 3:19 when he finished 17th last year. Tenth place was claimed by Michael Weiss (violet line) who had worked hard on the bike to close the gap to the front group with the second-best bike split of the day. Though his run improved this season, he wasn’t able to run sub-3 and to capitalize on his fourth position at the end of the bike. Javier Gomez (blue line) was one of the favorites to at least finish on the podium, but he was pretty much a non-factor this year. After a good swim he was content to ride with the Dreitz/Lange group and then lost some time at the end of the bike with a mechanical. But the bike was probably a bit too hard for him – he was never able to make up any time to the fast runners, and a lot of people expected him to run faster than a 2:59 and claim eleventh place in the end. Next to Camron Wurf, Andi Dreitz (orange line) got the most camera time on the bike: He was leading the group that included his teammate Patrick Lange for about 90 miles, keeping the pace solid. He admitted after the race that he probably worked harder than what was prudent for a good final result, and he slowly fell back on the run. Nonetheless, he didn’t fall apart and was able to run a solid 3:02 marathon, allowing him to claim 13th place just behind Tim Van Berkel. 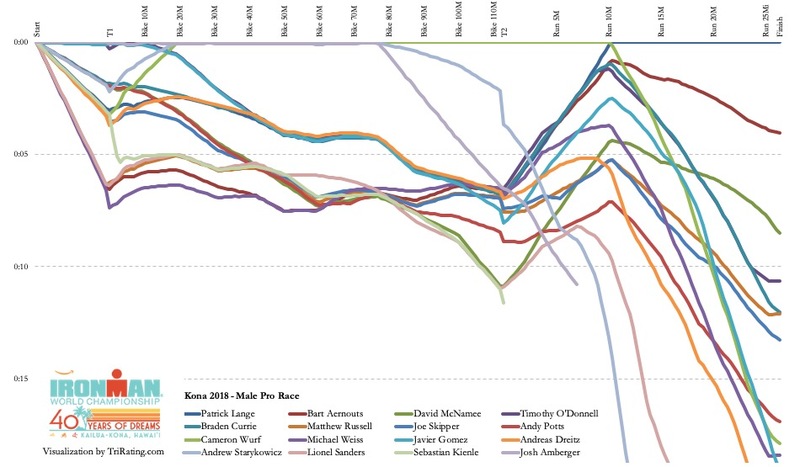 After his second place last year, Lionel Sanders (red line) was one of the pre-race favorites for this year, but after a rocky summer he didn’t have a good race in Kona. While last year he had a great swim, he was one of the last athletes after the swim this year and was never able to make up solid ground. He was working hard in the first half of the bike and around the turn at Hawi it looked as if he was bridging up to the Dreitz/Lange group. But then he fell back to the chase group and wasn’t able to match their pace when they worked to bridge up. He was in 20th pace in T2, starting the run with David McNamee but also didn’t have a strong run. After a 3:15 run he finished in 28th place. After the swim Andrew Starykowicz (light blue line) was less than two minutes behind the lead, and as promised before the race he quickly stormed to the front of the race and building a solid lead with Josh Amberger and Cam Wurf. 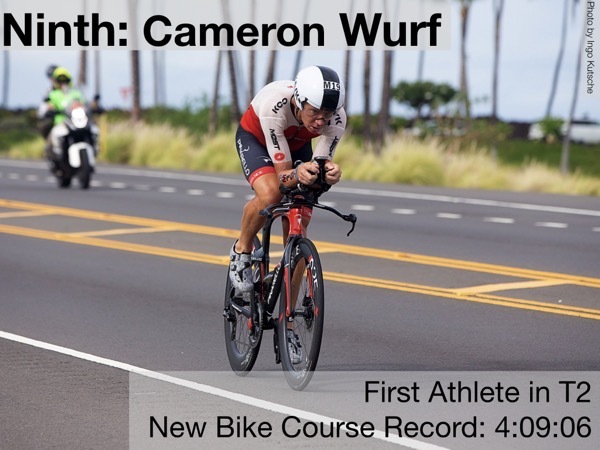 But at around 80 miles he started to struggle and was dropping back from Cameron Wurf. At the end of the bike he was more just two minutes back, but then took some extra time in T2 and then obviously wasn’t running comfortably. In the end, he ran a 3:44 marathon and finished in 40th place. Josh Amberger (violet line) was also at the front of the race for a good while. This year he had no intention to swim away from everyone else, but he probably dragged a few more athletes than intended into T1: There were eight athletes within 20 seconds of him, including Tim O’Donnell and Javier Gomez. But these athletes quickly started to drop back and when Andrew and Cam worked their way to the front of the race, he was able to ride with them building a nice lead. But then he was forced to drop back after about 80 miles and almost chased down by the Dreitz/Lange group. At the start of the run he lost some more time and then dropped out before climbing Palani. For Sebastian Kienle (green line) Kona 2018 also ended in a DNF. Race day started well for Sebi: After a great swim he was running through T1 with Cam Wurf and Patrick Lange. But right after starting the bike, he had some technical issues and had to get a new rear wheel – in his own words it was like “winning the lottery and then losing the ticket”. After that blow he never seemed to find back into the race – riding with the chase group and then losing more and more time when he would have needed to step it up. He called it a day shortly after T2 when problems with his Achilles made it impossible to continue. The first (and most obvious) observation about the 2018 race are the extremely quick times: There were new course records on the bike and overall including the first sub-8 finishes in Kona. The fast times were certainly aided by the fast conditions – there hasn’t been much wind on the bike and the race dynamics helped the overall times. I don’t think the swim quite developed the way the fast swimmers had in mind. After Josh Amberger swam away from the rest of the field in 2017 and was isolated for the first part of the bike, he said before the race that he was looking for company. This resulted in a very large front group at the turnaround, almost similar to previous years when no one was really pushing the pace at the front. Josh increased the pace in the second half and the front group dwindled down to less than ten athletes. A stronger pace from the start might have resulted in a smaller front group and also larger gaps in T1. 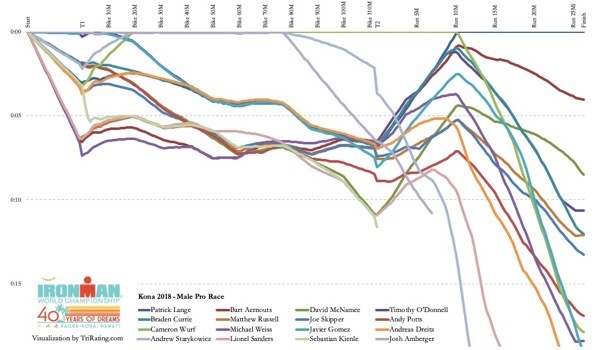 As you can see from the data and graphs in “The Cost of the Kona Swim” (a collaboration with Tim Floyd on SwimSwam), it is quite unusual for the eventual winner to be quite that far behind after the swim: In the last 13 races before 2018 only Sebastian Kienle was more than two minutes slower than the average of the ten fastest swims. This year Patrick Lange was almost three minutes slower and needed a strong start of the bike to put himself back into contention and eventually take the win. There is a similar observation for Top 10 athletes: It is very unusual for athletes that are more than six minutes slower in the swim to still make it into the Top 10. Between 2005 and 2017 there were only two athletes that were able to do that, this year another three athletes were able to make up the time. The way they did this is also something very unusual: They were able to bridge up to the front group after the turnaround in Hawi. 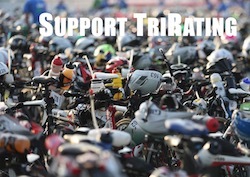 Usually, if you’re still behind at that point, you’ll only lose more time in the second half of the bike. This year, there was a group that was about three minutes behind at the turn but by T2 managed to ride up to the first big group. Among the athletes in that group, Matt Russell and Joe Skipper were still able to have great runs as well and finished sixth and seventh. 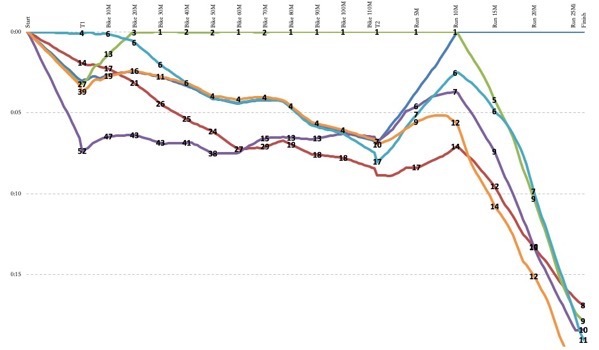 Next year’s race will give us an indication whether this year was exceptional or a “new normal”. Fascinated reading – thanks for doing this.